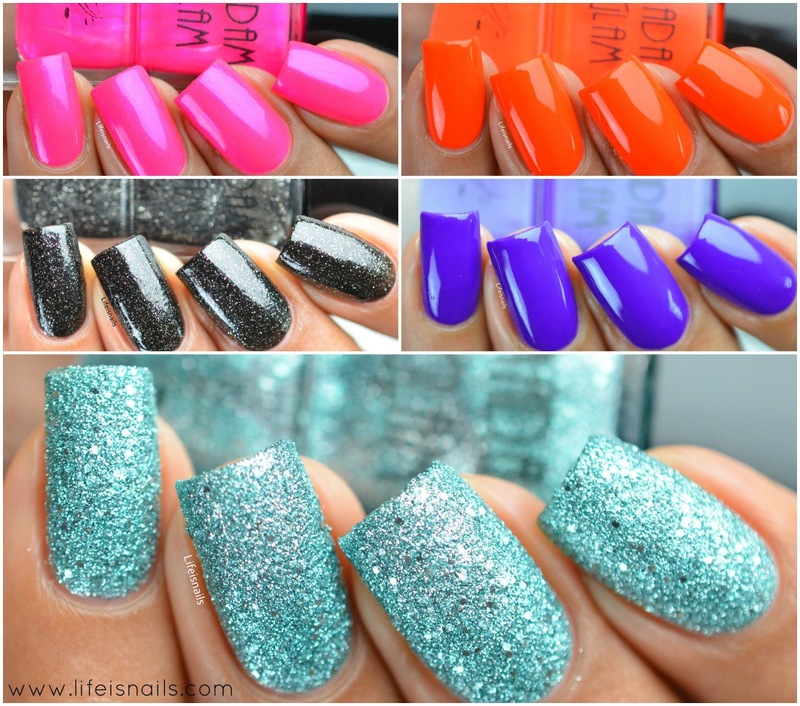 Today I have five beautiful polishes from Madam Glam to share with you! Madam Glam polishes are 5 free, Cruelty-free and Vegan.These come in a 0.5oz bottles with long and thin brushes. 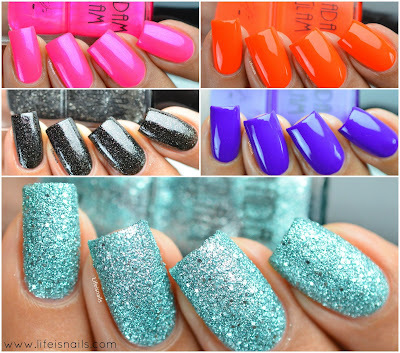 They offer Worldwide Shipping and have many more products other than regular nail polishes. So let's begin with the swatches, Shall we? First one is Hot date: It's a stunningly bright neon pink creme with a subtle blue shimmer to it. Shown here is two coats with top coat. Tiger Balm: A gorgeously bright neon orange creme. I absolutely loved this one even my camera couldn't handle its brightness haha. Shown here is two coats which didn't need a white base to pop. It's bright enough on its own. The formula was a bit on the thicker side but was not hard to work with. It's topped with a glossy top coat. 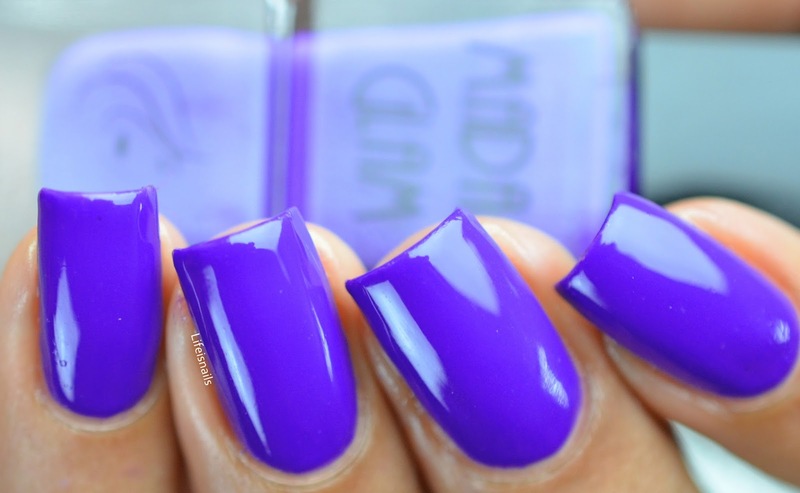 Candy coat: A gorgeous deep purple creme. The formula in this is so smooth that it applies like butter. Shown here is two coats with top coat. My Precious: A pretty black glitter polish in a sheer black base packed with silver micro glitter in it. It was sheer in its first coat but covered nicely in its coming coats. Shown here is three coats without any top coat. Diva: A marvelous light aqua textured finish micro glitter polish with tiny hex silver glitters in it. I absolutely adore this one because of its color and finish. It gets opaque in one single coat but because I like doing two coats I went with two. Shown here is two coats without top coat. So overall, I loved each of these polishes and if I have to select one out of all as my favorite, I will choose Diva because I love textured finish polishes plus its gorgeous!! :D Which one was yours? First one is Simple Single Chevron Mani. The products used for this mani are mentioned below with their respective links. Last one is Bright neon Negative Space Nails: The products used for this mani are mentioned below with their respective links.